Brian Reed didn't know what to tell his daughter. He was driving to visit her at college in October when he received dreadful news: After a 24-year career making roller bearings, his employer, Rexnord, was moving his Indianapolis job to Mexico. "Devastation set in," says Reed. "What am I supposed to tell my daughter -- I can't pay for tuition?" Kiley, his first-born and a freshman at Hanover College, is aiming to be the first college grad on either side of the family. Reed says showing up for work now "is like buying the ticket to the Titanic and you know the ending." His job is one of 300 that Rexnord is moving to a sprawling facility in Monterrey, Mexico. 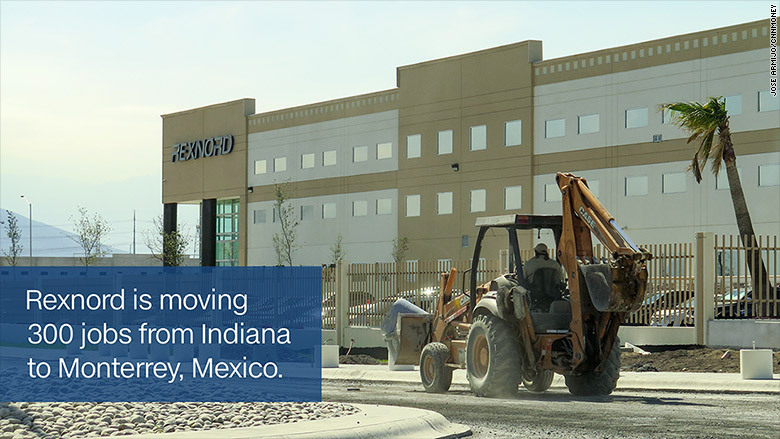 Nearly 1,500 miles south of Indiana, the story outside Rexnord's Monterrey plant was decidedly different one day last month. A worker was putting the finishing touches on a cement wall surrounding the plant as trucks were hauling in materials. The dirt road entrance led to a packed parking lot. At the end of the road stood Eustolio Bonilla, a fresh-faced 22-year old who had just applied for a job at the Rexnord factory. "They told me there were vacancies, and so I decided to bring my resume," Bonilla told CNN's Leyla Santiago while holding his application in hand, waiting for a bus on the windswept road in Monterrey. Bonilla says he'd been working odd jobs for months, hoping to find steady employment at a place like Rexnord. Stories like these are why President Trump hates America's trade deals like NAFTA, the agreement between Canada, Mexico and the U.S. that became law in 1994. The Rexnord story fits Trump's portrait of trade -- Mexico wins, America loses. Its two sides illustrate how Trump faces an uphill battle against the larger forces of globalization -- namely cheap labor and global supply chains. Assembly lines stretch over borders and oceans these days. In Indiana, Reed doesn't know what he'll do next. Applying for other jobs means he would risk losing his severance package -- six months pay and health care plus a $1,500 exit "bonus" if he stays until the plant closes this spring. Reed earns $24.03 an hour, which gets him about $55,000 to $60,000 a year, working six days, or 60 hours a week. Reed and other Rexnord workers say the company has dangled their severance packages in front of them "like a carrot." If they stay till the very end, they'll get severance. On Tuesday, Reed said Rexnord was hosting a jobs fair, but knowing the risks, he doesn't plan to go. In a statement, Rexnord acknowledged the move was a "difficult decision and we understand the human impact." It said it plans to provide "transition services" for employees losing their jobs. Rexnord did not comment specifically on the terms of the severance package. "It's just a slap in the office," says Reed, who spends his free time hunting, fishing and watching his son's baseball games. "They just got us hog-tied to where we can't move on with our lives." 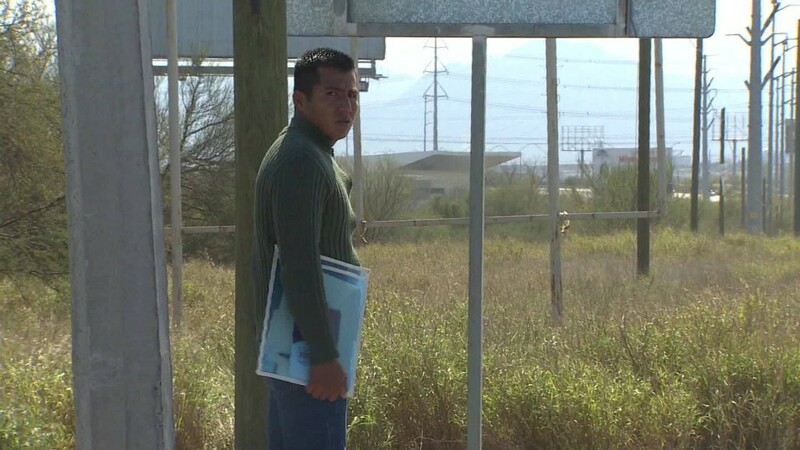 Mexican worker Juan Ramon Trevino earned 1,200 pesos a week ($58) as a repairman -- what Brian Reed makes in a couple hours in the U.S.
Down in Monterrey, another factory worker, Juan Ramon Trevino, represents the key reason why companies love Mexico: cheap labor. As a repairman, Trevino has earned about 1,200 pesos a week ($58) -- what Reed makes in a couple hours. That wage gap is a big reason why more than 1,600 American companies have operations in Monterrey's state, Nuevo Leon, including John Deere (DE), GE (GE), Carrier (UTX) and Caterpillar (CAT). Rexnord will soon join those ranks. There are roughly 700,000 manufacturing workers like Trevino in Nuevo Leon. From fixing transformers to manufacturing toys, Trevino's calloused hands speak for his years of hard work. 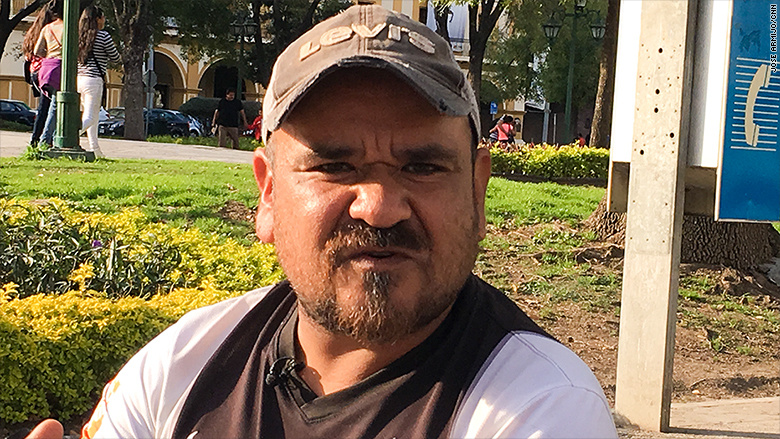 Trevino is out of work now and he was recently sitting in Monterrey's main square filling out job applications when CNN caught up with him. Before the U.S. election, he considered going north of the border to find a job, but he says he wouldn't do that now with President Trump at the helm. He just wants a better education for his 8-year old boy, Jose. "My goal now is to get my family ahead. I don't care if it's a company from the United States or a Mexican company. I only want to work," says Trevino, 41. Trump blames NAFTA for a flood of jobs to cities like Monterrey. 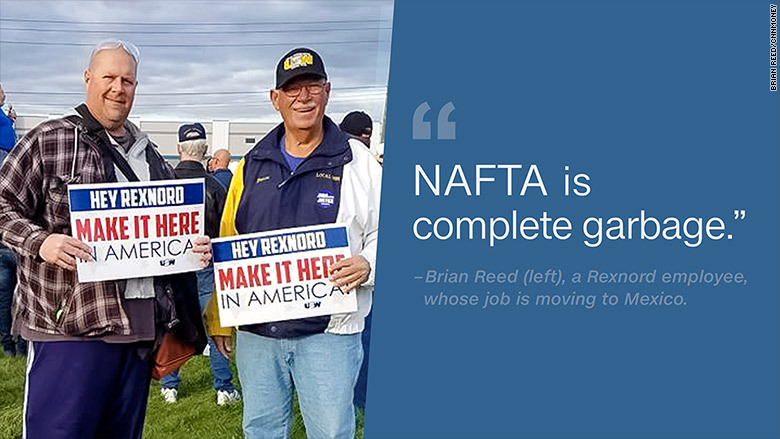 Nonpartisan congressional research, however, concluded in 2015 that NAFTA didn't trigger an exodus of American jobs. Still, Trump threatens to withdraw from NAFTA if the U.S. doesn't get a better deal. Experts say tearing up NAFTA and slapping on tariffs would be terrible for both countries. "If we don't agree and we start a war of tariffs or one without trade agreements, we're going to enter a fight that, in the long term, is not going to benefit anyone," says Adriana Berrocal, president of the Mexican Institute of Finance Executives in Mexico City. Despite all of Mexico's gains from NAFTA, Mexican officials are the first to point out that Mexico has lost, too. "Mexico was not given a free ticket. We paid our price. There are millions of people who lost their jobs here," says Fernando Turner, secretary of economy and labor in Nuevo Leon. "The United States needs Mexico as we need the United States, and fortunately, we can't separate. We are like Siamese twins. We can't split it up." And here's where Trump stark portrayal of NAFTA -- Mexico wins, America loses -- conflicts with reality. Winners and losers are defined by industry rather than nationality. In some industries, there are both winners and losers. And wages have stagnated on both sides of the border, more so in Mexico than America. But among the biggest losers are Mexican corn farmers. Despite cultivating corn for thousands of years, Mexico now relies heavily on shipping in U.S. corn. That's because Mexican farmers couldn't compete with their northern counterparts once NAFTA became law. In the first decade of NAFTA, Mexico lost about 900,000 farming jobs, according to a report by the U.S. Department of Agriculture. American corn farmers were partly subsidized by the U.S. government and they gained free access to Mexico with NAFTA. "NAFTA has been a great agreement for us to have market access," says Kurt Hora, president of the Iowa Corn Farmers Association. "Mexico is a huge market for us as corn farmers in the United States." Reed, the Rexnord worker losing his manufacturing job, feels differently. "NAFTA is complete garbage," says Reed. "Everybody is losing except the Rexnord Corporation." Reed worries prospective employers won't hire a 45-year old like him. He's not sure if he should try to apply for jobs that involve his manufacturing skills or acquire training for new kinds of jobs. The jobs that have piqued his interest pay between $11 and $14 an hour, far less than his $24 an hour wage. He admits this year could be the last time the whole family takes its annual beach vacation. Faced with the uncertainty of free trade, Reed insists he's determined to make his kids' dreams a reality. "My kids will get everything they need," says Reed. For Kiley, the college freshman: "I will make it work, I will work two jobs, it's sure not the American dream but if it's for her dream, I promised her I will do it."